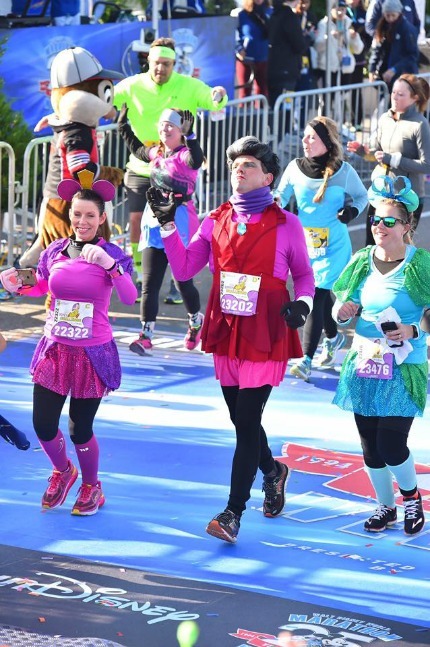 I have never been one to care about running in costumes, it was just never something that was important to me. However, if you know anything about Laura and Jackey, they make it part of the whole race experience. It’s actually pretty amazing that I held out for as long as I did. Except for a couple of minimalist costumes for the 2016 Disneyland Half Marathon Weekend, I was always standard running shirt and shorts. This weekend though, they had me dive in completely head first, and we all took our costume game to entirely new levels! 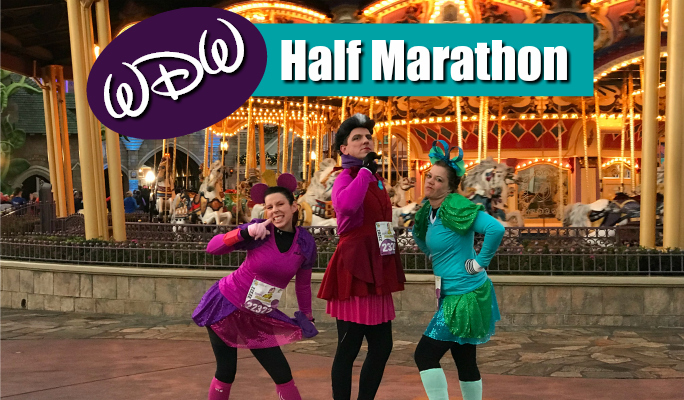 Be sure to check out the half marathon video recap Laura made over at our YouTube channel as well as our podcast chat. Now back to the recap! The ideas of our costumes became somewhat of a sticking point amongst the three of us, but the one theme we were all in agreement with was for the Half Marathon. 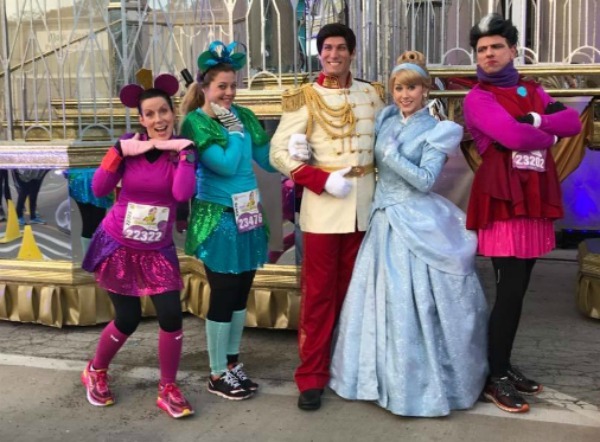 We knew that with a course that goes through the Magic Kingdom, we definitely wanted a Cinderella theme, and it didn’t take long to cast the parts. When I was thinking about it, there are only a few male parts in Cinderella, and they are all fairly boring. Plus, I figured if I was going to do this, I really needed to go all out and do it right. The first character that I thought of was Lady Tremaine. It made sense: I was tall and slender enough, I’m very aristocratic, can be down-right nasty, and let’s face it, seeing me in drag would certainly make a statement. From there the other parts were easy: Jackey and Laura would be the step-sisters, our friends Kimberly and Heather would be Cinderella and the Fairy Godmother respectively, and Shannon and Leslie would round us out by playing mice. It was perfect! Until, that is, it came time to actually make the costumes. I knew right away that everything from my end would have to start with the hair. Lady Tremaine has such an original and iconic hair-do, it had to be right. With the help of my wife, and some advice from our hairstylist, we set out on making a wig. Not months in advance mind you, no we waited until a few days prior to me leaving for the Marathon! It became clear right away that it wasn’t going to work, but I had an ace up my sleeve. I knew I still had an Elvis wig from the 10K. I thought, perhaps, that I could repurpose it by spray painting it and cutting the sideburns off. The day of the 10K was extremely busy for us, and if you haven’t yet, read Jackey’s recap to see our adventures. We got back to the room late, and at this point I was thinking we would have to scrap my costume all together. Jackey went straight to work by cutting the sideburns off and pinning the wig to the point that it looked like we could actually pull this off. The spray paint didn’t really make much of a difference (the wig was just too black), but thanks to our friend Cori and her trusty baby powder, we made it work! We also did a test run of my makeup, but Jackey felt it was too conservative. Our awesome friend ShaeLee told us not to worry, she would be up at 2am to make me look pretty! Of course, Jackey and Laura still needed to work on their costumes, and at this point it was getting really late. What were we thinking with these costumes? The morning came and everything ended up working out. We all looked great, and ShaeLee knocked it out of the park with my makeup! (note: you can see a clip of this in our recap video here) We were a little later that morning, but with Leslie driving us, we still got to the starting area just as the resort busses were arriving. It was another very cold morning, and personally I thought it was the coldest and was starting to get really grumpy about the weather. 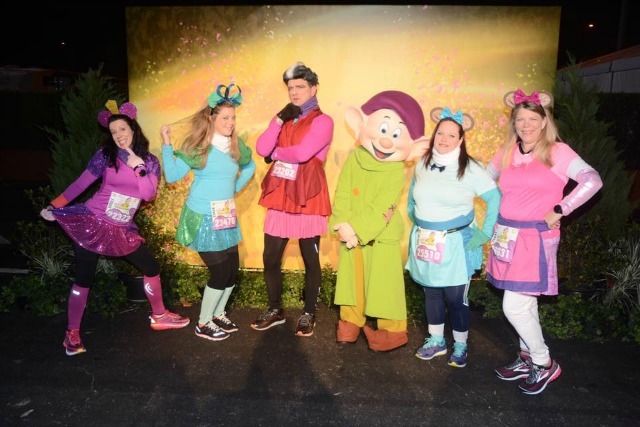 However, we still made the best of it by getting some pictures with Dopey, Donald and Goofy. Seeing the characters react to my costume really made it fun, and I was so glad that it turned out as well as it did. We then set out to the corrals, and we were in Corral D this time. The course starts out of the Epcot parking lot, towards the TTC and Magic Kingdom parking lot. It was really dark for most of the first few miles and not a ton of entertainment. We had set a rule that any Cinderella related characters we would stop for, and we each had a wild card we could play. Before we got into the Magic Kingdom parking lot, Laura spotted a pirate ship in the median of the highway. She knew that coming back we would see Captain Jack and Barbosa, so she called hers right away. We made our way through the TTC over to the road that takes you to the Contemporary Resort. It was very bottle-necked during this stretch, but soon we were turning towards the Magic Kingdom, and we all got a pleasant surprise! Typically you go into Magic Kingdom through a backstage area that kicks you into Town Square. This time they had us loop around the front by the busses and into the main entrance. I can’t tell you how magical this was! It totally changed the feel of the race from here on out! We were welcomed by many of the citizens of Main St as we left Today and entered into a “world of Yesterday, Tomorrow and Fantasy.” It was still dark out, so the lights looked fantastic, and this would be Jackey’s first time running down Main St with all of the Christmas Lights lit up on Cinderella’s Castle. I love running down Main St, and all of the spectators that line the street really add to the whole experience. 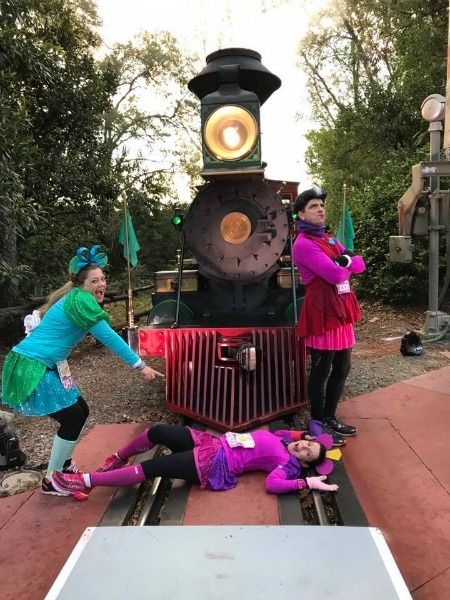 We turned into Tomorrowland, where we would take full advantage of actual facilities and make our first “pit stop.” The ladies needed to adjust their costumes, and we were wearing so many layers it really made things difficult. I just wasn’t sure which bathroom I was supposed to go into? After gathering ourselves, we made our way into Fantasyland. As we headed towards the carrousel and turned towards the Castle, we saw what would end up being our first character stop of the day: the mice from Cinderella! We were so happy, especially knowing the Shannon and Leslie would be able to get their picture with them dressed as mice! We then made our magical run through the castle, and stopped by the Photopass in front of the castle, which turned out to be one of our best Castle pictures ever. They really did a great job of making it look like nobody else was there. We then trotted through Liberty Square, where Jackey had to do her traditional Liberty Bell Picture. We then plowed through Frontierland, stopping at the train to take another “must-do” photo! As we entered into the backstage area we saw the giant Princess float that they use for special parades, and guess who was out? Cinderella and her Prince! The line was huge, but we knew we had to wait. As we were getting closer, Aurora and her Prince came out and joined them, and we were getting worried that Cinderella might leave. Fortunately, they did not, and we got an awesome picture with them! We left the Magic Kingdom and started on “Cone Alley,” which is the stretch of road that goes by the Grand Floridian And Polynesian Resorts. 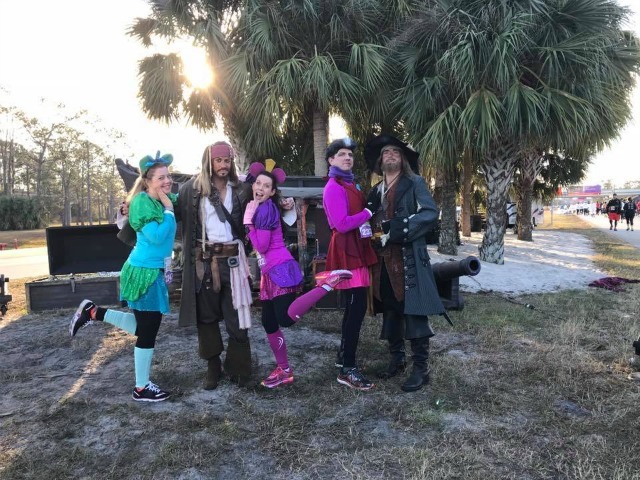 We ran into our friend Jen Sorenson, stopped for a picture with “The Wedding Guys,” and started on the road back to Epcot where we finally found Captain Jack and Barbosa. The girls were going to fawn over Jack and I was going to take Barbosa, which I think scared the heck out of him! We finally ended up at Epcot, and Jackey and I never ended up using our “wild card” for a character selection. We happened upon Stitch at the entrance into World Showcase, and decided to stop simply because there was hardly anyone there. We then headed towards Spaceship Earth, made our way out of the park, and towards the finish line. As we crossed the finish line, we got one of our best finish line photos ever! We were so glad to be done, as we were so sick of the cold. However, our costumes really saved the day and made it an incredibly fun and stupidly funny race. This is why I am a convert when it comes to race costumes, as they really do add to the experience, and can save an otherwise miserable time. I mean, looking back we didn’t stop for many characters, but we got so many great Photopass pictures, it made it so worth it! We hung around long enough for Laura and I to grab our traditional post race beer, talk to a few friends and be on our way. Leslie had to go to the car center because of her flat tire from the day before, so we took the race busses back to the resort, which was fine. As far as half marathons go, this one is not my favorite course. I much prefer going through the other three parks as I feel it is more of a value. However, as part of the marathon weekend, this is a great race, and even with the cold will certainly go down as one of my favorite races ever! 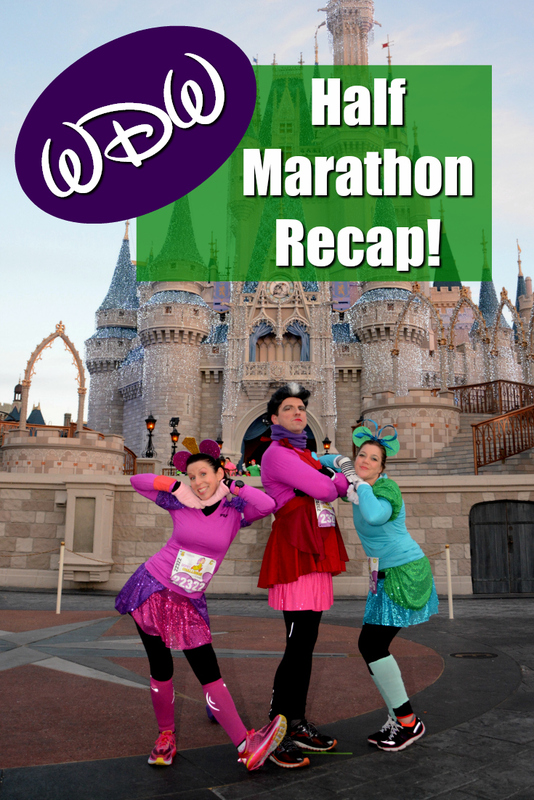 QOTD: Did you run the 2018 WDW Half Marathon or runDisney’s Dopey Challenge this year? What did you think? 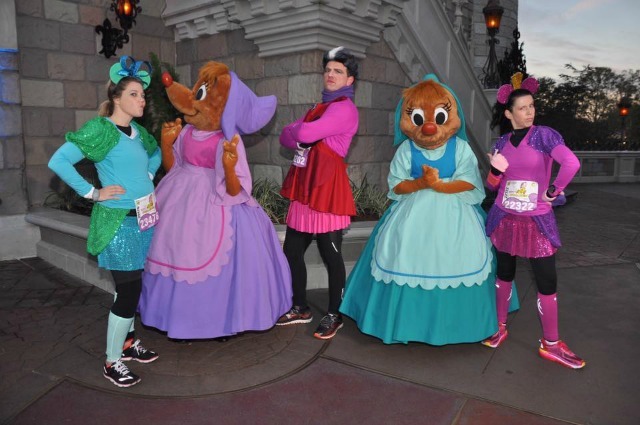 Bonus QOTD: Do you like to run in costumes? 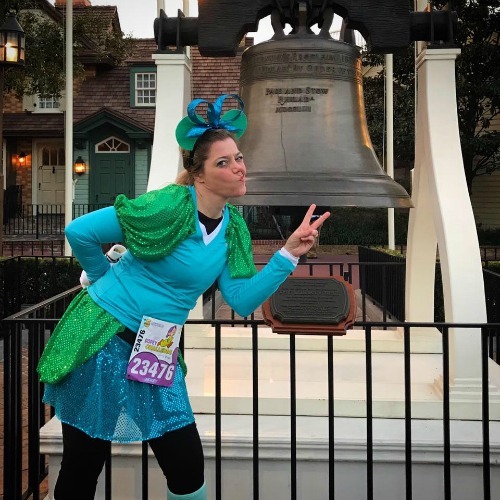 What was your favorite costume to run in? Be sure to Tweet at us, hit us up on Instagram or Facebook, and be sure to join our Joyful Miles Running Club. Also, subscribe to our YouTube Channel and Podcast so you don’t miss a thing! 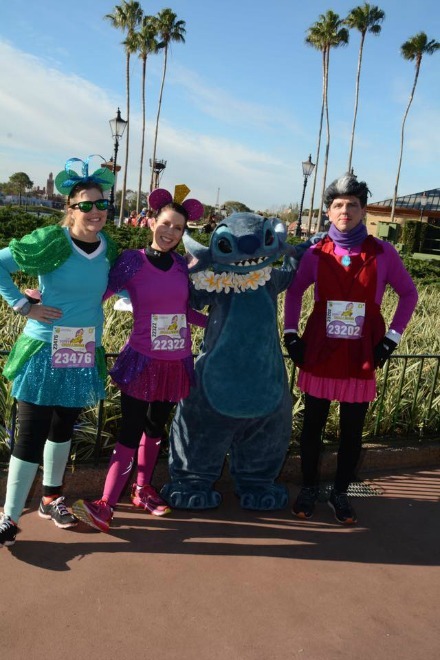 I love to run in costume…I think it adds to the fun of the whole experience. 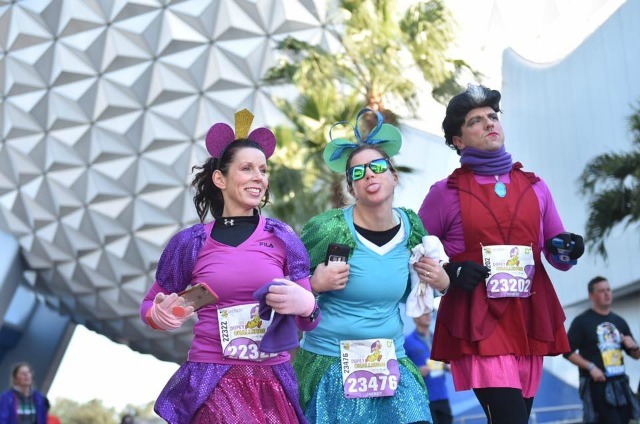 My favorite was dressing as Lumiere for the inaugural 10K of Wine and Dine Weekend. I used battery operated tealights and it worked great! Oh wow, your Lumiere costume sounds amazing!! Using tea lights sounds brilliant! Running costumes are the best. All the talk about your costume and I have “I feel pretty” in my head. Costumes make everything fun. LOL, I can just imagine Rob singing “I feel pretty!” He totally would, too and yep, running costumes are awesome!! Previous post: Why I love Running!